photos and recipes by Marisa McClellanMy mother is a true believer in soup. Her biggest pot comes out at the first hint of fall and remains on the stove until the last wisp of chill leaves the air the following spring. Her specialty is chicken soup (she is a Jewish mother, after all), but she is also fluent in lentils, beef stew, creamy squash and all varieties of cruciferous vegetable. Some of my coziest childhood memories involve bowls of her soup, a few crackers and a glass of milk. To this day, it’s a meal that instantly erases anxieties and soothes frayed nerves. I am joyous that the cool weather has returned, inspring me to pull out my own big blue soup pot and start stewing. As an adult, my appreciation for soup has done nothing but increase. Most soups can be endlessly expanded, so there’s always enough for friends or lunch the next day. And the flavor just gets better after a night in the fridge. Lastly, most are dead easy. When I make soup at home, my recipes usually fall into one of two categories: big, brothy and full of chopped vegetables, with just a bit of meat to tie things together, or pureed and mostly vegetable-based. My recipes today follow suit. 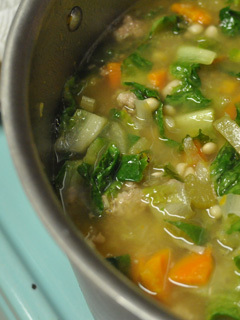 The sausage and escarole soup is hearty and able to satisfy any resident meat eaters. This cheesy cauliflower soup will thrill kids (particularly if you don’t tell them it’s full of vegetables). And the carrot peanut butter soup is perfect for the vegans in the crowd. In a large soup pot, heat the olive oil until it shimmers. Add leeks, carrots, celery, onion and rosemary, and brown for seven to eight minutes. When the vegetables are golden, push them to the edges of the pot, creating a well in the center. Drop the sausage into that center well and break it up with a wooden spatula as it cooks. Once the sausage is brown and has been stirred into the vegetables, add your liquid. Bring to a simmer and let cook for approximately 15 minutes, giving the vegetables a chance to soften and flavor the broth. Ten minutes prior to serving, add beans and escarole. Add salt and pepper to taste. Serve when the greens are fully wilted. In a large soup pot, sauté the chopped cauliflower, carrots and leeks in butter and olive oil. Allow them to soften and brown for seven to eight minutes over fairly high heat. When the bottom of the pan begins to brown, deglaze the pan with the white wine (if you don’t want to use white wine, feel free to skip it and head straight to the stock). Use a flat wooden spatula to scrape any brown bits off the bottom of the pot. Add the chicken stock, reduce the heat to medium, apply a lid and allow the veggies to simmer for approximately 10 minutes (the larger your veggie chunks, the longer you’ll want them to simmer). In a medium saucepan, begin the white sauce by melting the butter over medium-high heat. Sprinkle the flour over the butter and use a whisk to work it together. Let it brown up a bit. When it begins to develop a nice toasted color, pour in a couple of tablespoons of milk and whisk to incorporate. Add the milk bit by bit, whisking to incorporate after each pour, until all the milk is worked in (if you pour in all the milk at once, you’ll get lumps). You should now have a white sauce of moderate thickness. Add your grated cheese and stir until melted. Now add the cubed cream cheese. (I realize this is sort of a lowbrow addition, but believe me, it works.) Finally, add the salt, pepper and nutmeg. Once the sauce is smooth, turn the heat down to its lowest setting and return your attention to the pot of veggies. By this point, your cauliflower, carrots and leeks should be pretty soft. Now it’s time to puree. I like to use an immersion blender because you don’t have to dirty another vessel and it doesn’t make the soup too smooth. If you don’t have an immersion blender, you can use a countertop blender, food processor or food mill. But take care when using a blender or food processor—work in small batches and use a folded kitchen towel to cover the lid and prevent splatter. Once the soup is smooth-ish, pour in the cheesy sauce. Carefully stir to incorporate it. Taste and adjust seasonings. Unless you used a salty cheese, it will probably need a bit more salt. This dish was inspired by the carrot soup recipe in the original edition of the Moosewood Cookbook. Why they changed the recipe in the revised edition, I’ll never know. Heat the olive oil in a large pot over medium high heat. Add the onions and carrots and sauté until golden. Add garlic and cayenne pepper. Stir to integrate. Add peanut butter and work into the veggies. Add the stock, reduce the heat to medium low and simmer for 15 minutes, or until the carrots are tender.